This species is accepted, and its native range is N. & E. Central Europe to Mongolia, Subarctic America to W. Central & N. Central U.S.A.
Perennial. Rhizomes elongated; fleshy. Culms erect; 100-150 cm long. Ligule an eciliate membrane; 2-6 mm long; lacerate. Leaf-blades 15-30 cm long; 5-10 mm wide. Leaf-blade surface scabrous; rough adaxially. Leaf-blade apex filiform. Inflorescence a panicle. Panicle open; lanceolate, or ovate; 15-25 cm long. Panicle branches angular; scabrous. Spikelets solitary. Fertile spikelets pedicelled. Spikelets comprising 3-4 fertile florets; with diminished florets at the apex. Spikelets ovate; laterally compressed; 8 mm long; breaking up at maturity; disarticulating below each fertile floret. Floret callus pilose. Floret callus hairs 0.1-0.2 length of lemma. 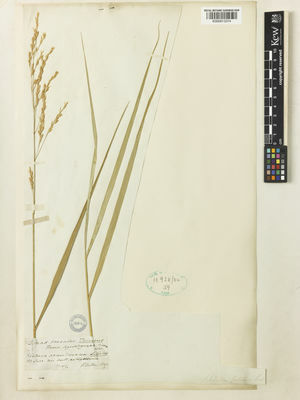 Glumes persistent; dissimilar; reaching apex of florets, or shorter than spikelet; thinner than fertile lemma. Lower glume lanceolate; 4-5.5 mm long; 0.75 length of upper glume; membranous; without keels; 3 -veined. Lower glume apex acute. Upper glume elliptic; 5-6 mm long; 0.75-1 length of adjacent fertile lemma; membranous; without keels; 5 -veined. Upper glume apex acute. Fertile lemma elliptic; 6 mm long; scarious; without keel; 7 -veined. Lemma surface smooth, or granulose. Lemma apex erose; acute. Apical sterile florets resembling fertile though underdeveloped. Lodicules 2; membranous. Anthers 3. Ovary pubescent on apex. Europe: northern, central, and eastern. Asia-temperate: Siberia, Soviet Middle Asia, Caucasus, western Asia, and China. North America: Subarctic, western Canada, northwest USA, and north-central USA. Fluminia arundinacea (Roem. & Schult.) Fr. Graphephorum arundinaceum (Roem. & Schult.) Asch. Schedonorus arundinaceus Roem. & Schult. Valdés-Reyna, J. Villaseñor, J.L., Encina-Domínguez, J.A. & Oritz, E. (2015). 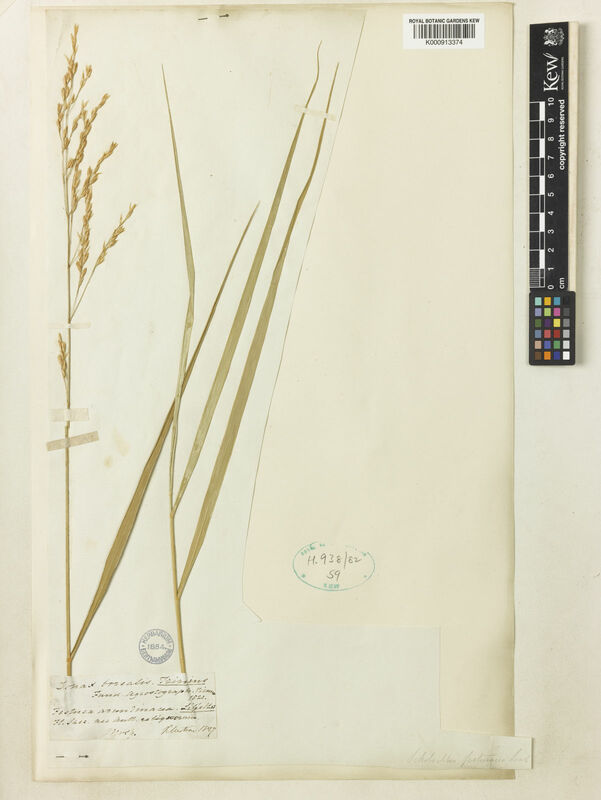 The grass family (Poaceae) in Coahuila, Mexico: diversity and distribution Botanical Sciences 93: 119-129.